Here are a few tips and information to get you and yours prepared to deal with winter’s travails. Some of this is knowledge and some of this is physical preparation; either way, commit to some action now so you don’t have to deal with precarious, not to mention cold, situations later. Bookmark this post in case you ever need quick access! The Federal Emergency Management Agency took its lumps after its Hurricane Katrina response, but for the most part they know what they’re doing. Here’s a great video and supplemental info on how to prepare before, during, and after winter storms. Perhaps one of the most difficult/frustrating parts of a winter storm is driving sharing the road with other people that don’t know how to drive in the winter. Check out this good AAA tips video below and go out and practice in an open parking lot next time it snows. Here in the immediate DC Metro area, we may not average enough annual snowfall to merit such a purchase (debatable), but I’d highly consider purchasing a set of winter tires/wheels if you’re at all concerned or not confident in yours or loved ones’ driving skills. Winter tires can often make all the difference, especially when tractions technologies (including 4WD and AWD) fail. Check out this more technical BMWblog discussion on the technologies behind winter tires. At the very least, I’d strongly consider purchasing some sort of winter automotive emergency kit. Surely consider spouses and children in this decision as well. It may be a great idea to put one of these in his or her trunk just in case. With the threat of adverse winter weather in the region, people will often ask me for advice regarding travelling; specifically driving. There are spartan mapping tools that take into account weather conditions, but the National Weather Service has recently come out with a nifty experimental application that allows users to create custom weather maps and track future weather along the path of one’s road trip. So if you’re wondering what the weather will be like all along your route to Kalamazoo to visit your in-laws for Christmas, and more importantly if you’ll need to postpone or detour because of bad weather, now you’ll know! Please visit my sister sites! Faith...on a level we can understand. So I live near Dulles Airport (IAD) which has received 33.2” so far this 2013-14 season (above its average of 22”) and I thought I’d take a moment to make a case for shutting down publically funded snow treatment, plowing, and removal. A case against what?! Isn’t snow plowing, treatment, and removal like a necessary civic service on par with stoplights and fixing potholes? Do you also believe the moon landing was done on a Hollywood set, deny global warming is happening, and suppose the government is hiding a certain something in the Nevada desert? You would think so but you may be surprised to find the means may not necessarily justify the ends as much as you’d think. Intuitively you’d think snow plows and physical safety would go hand in hand right? But have you considered some of the negative factors of safety that snow plowing fosters? Have you ever driven behind a slow moving plow? Can you see anything in front of you? Can the driver coming from the other direction on the already narrow plow lanes see you behind the massive plow? Yes I know they caution to stay very far behind, but scenarios invariably come together that force you in close proximity with a massive truck pushing tons of snow around. Not a good combo a lot of the time. Less snow-moving behemoths out there, especially during rush-hour times, the better I say. Perhaps in the northern states and Canada the general public knows how to drive, but once the streets get plowed around here, people that have no business driving on still snowy or slick roads seem to start driving about. I saw a Toyota Prius driving in the middle of the last snow storm! If the roads weren’t plowed, or as much, people in front-wheeled cars with 17” tires wouldn’t be able to get out of their driveway…and that would be a good thing. In northern states and Canada, government mandates compel all citizens to drive around with winter tires during the winter months. Makes sense because winter tires do a boatload more for your vehicle in hazardous conditions. Well we don’t have those mandates down south in DC, so once again, once the roads get plowed, folks in their front-wheel drive CRV think, “The plow came by our street, let’s go to Starbucks!”. Accidents ensue. The last snowstorm I came close to accidentally clipping a pedestrian. It was dark and this person was walking right down the plow lane (because the sidewalks had snow on them). If people want to walk that’s fine, but don’t do it almost in the middle of the road and get mad at me! A plowed street somehow give pedestrians an entitlement mentality that all the sudden drivers should be totally ok with folks walking in the middle of the street – something only a crazy person would do on a normal day. If the plows weren’t around people would walk, or trudge, on the sidewalks still…and they’d be safer for it. Not much needs to be said here. Snow plow trucks contribute in large part to the creation and degradation of potholes on the road – what with their massive shovel and tonnage. Potholes can potentially ruin your car’s suspension or worse yet contribute to accidents. Less 10,000lbs trucks pushing around 2,000lb metal/asphalt grinders, less potholes. There are not too many things more unattractive then massive piles of brown snow lined up or streets caked in salt up and down your lovely neighborhood roads is there? Am I right? As they melt is gets worse too! It takes 3 or 4 legit rainstorms to wash all that sand and grime away. It’s not pretty when April flowers are blooming next to old snow piles in the parking lot that have been sitting there since January. 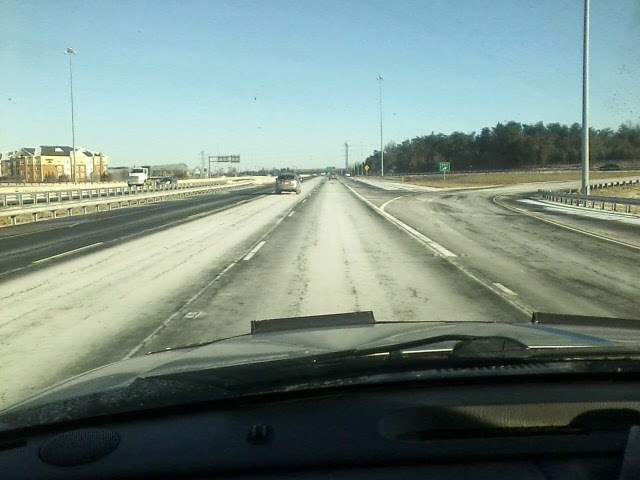 Right three lanes concrete? Nope, just caked in salt and treatment residue. Well because economics, and more specifically financials, often have heavy influence on peoples’ perception of civil problems and solutions, I defer to the financial argument. Northern Virginia’s snow removal budget alone is $63 million for Winter 2013-14, up $8 million cool bucks from last year. And sometimes governments go over budget on these things during boom snowfall years, like this one (and sometimes they go under as they did in 2012-13). I’m not advocating complete disintegration of publically funded snow removal (see below Solutions), but just imagine where that budget money could be re-apportioned to…higher pay for teachers, more skateboard parks, and my and your favorite, lower taxes! Further, state and local governments have invested millions in inventory, storage, and equipment. 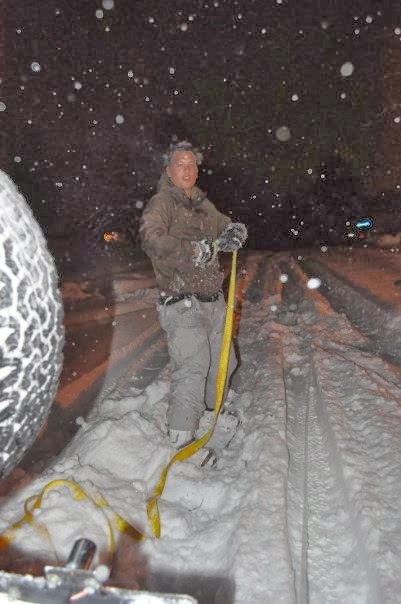 The Virginia Department of Transportation (VDOT) has “has more than 4,000 pieces of equipment (state and contractor) available to clear a typical six‐inch storm” for northern Virginia alone. Let’s say we divest just half of those assets…can you imagine the influx of cash? Where should it go? Well back to the citizens of course. I’ll take a few extra bucks in my pocket in lieu of unplowed neighborhood streets (that will inevitably melt and clear naturally and in most cases a 4x4 vehicle driven properly has no problem traversing) any day. I don’t like making a case against something without offering an alternative solution if possible. This case is no different. As I mentioned above, I’m not advocating to complete abolishment of snow removal services, just smarter services. Tell me again, why does every neighborhood, cul-de-sac, and sleepy backroad need to be plowed by state and local monies? Of course emergency routes should be cleared, but non-emergency? Let’s privatize this operation a little more folks. Just as strip malls, churches, and other private entities contract out their snow removal services, let the public decide (apart from emergency routes) what they want to pay for. VDOT is responsible for 17,737 lane miles in northern Virginia alone…I highly doubt the vast majority of those “lane miles” are critical routes. If my neighborhood association was stuck with the $20,000+ bill for snow removal, I’m pretty sure most residents would say no thanks. But how can emergency vehicles get around if the roads aren’t plowed? Pssshhaaa. Any municipality and local government worth its salt, no pun intended, will outfit its emergency vehicles already with the appropriate winter driving accessories. They’ll be fine. The rock-solid retort to my case you say? 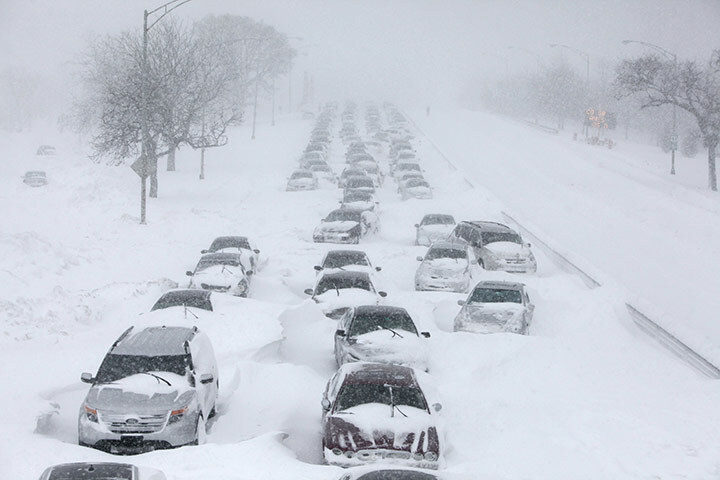 How can schools ever open if most of the roads aren’t plowed you say? Well think about it…any time there is debate about whether schools close it’s always about student safety, not the buses. They’re 10,000lbs and are surprisingly capable in wintry conditions (save ice…but no vehicle is). 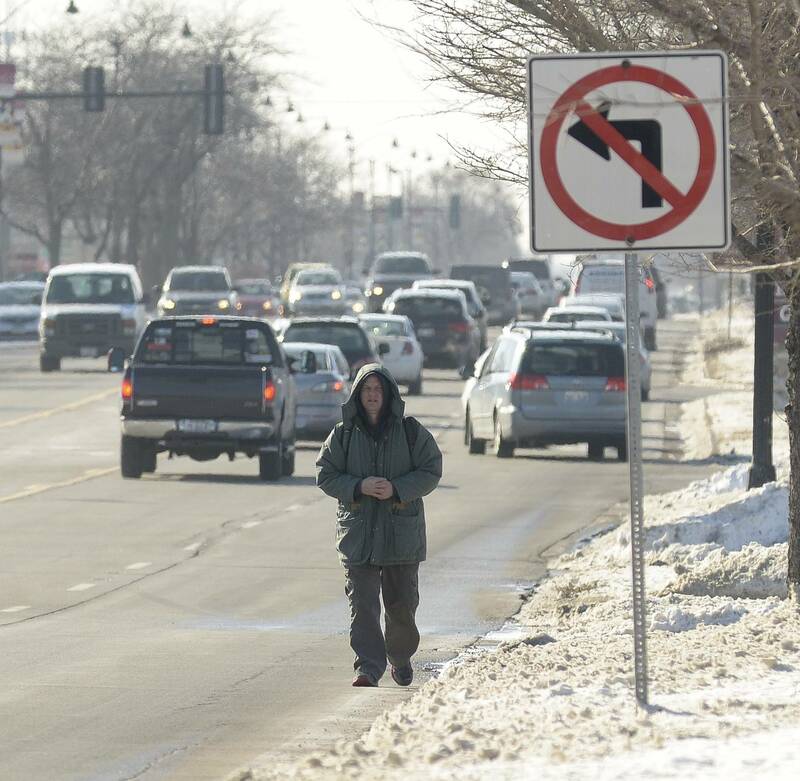 The issue has always been primarily sidewalks…not roads when schools closures are of concern. The main solution I have to this is to spend the money on getting the sidewalks cleared for kids, and pedestrians mind you, to walk to and from the bus stops. Either force residents to shovel their sidewalks (already a mandate, but unenforced) or use the budget money to contract it out. The second response I have to this argument is more beyond the scope of this article, but basically the fear is if the roads, and/or sidewalks, aren’t cleared then schools will have to close a lot longer and kids will be in school till the middle of July if we did that. Well wake-up call…many developed nations in the world already have year-round school schedules, and especially the countries that are ahead of us academically. Year-round school would not only give us more than enough cushion for snow days, but it would most likely help out America’s intellectual capital. Just sayin’. I recently wrote an article about “Why I Like Weather…and Crippling Snowstorms”, and it emphasizes in part the point of why it’s ok to be stranded at home. Canada does it and people don’t seem to complain. Why not force drivers in America to? Shoot, all the money we’d save from diminished snow removal budgets could help folks pay for them. It is important to remember that in terms of road safety, winter tires have proven their worth. They ensure that the vehicle has better stability when braking, make it possible to stop in a shorter distance and help the driver to stay on course around bends. · Beet juice has been proven to lessen the corrosive properties of the salt that we use to apply to the roads. · Beet juice cost are relative the same as calcium per gallon. · Beet juice and salt brine will work at temps approaching zero but with the addition of calcium we can theoretically achieve a little lower temperature before freezing occurs. · At 30 degrees, one pound of salt will melt 46.3 pounds of ice, but at 0 degrees, the same pound of salt will melt just 3.7 pounds of ice. · Regular water-based salt brine works well until 25 degrees. 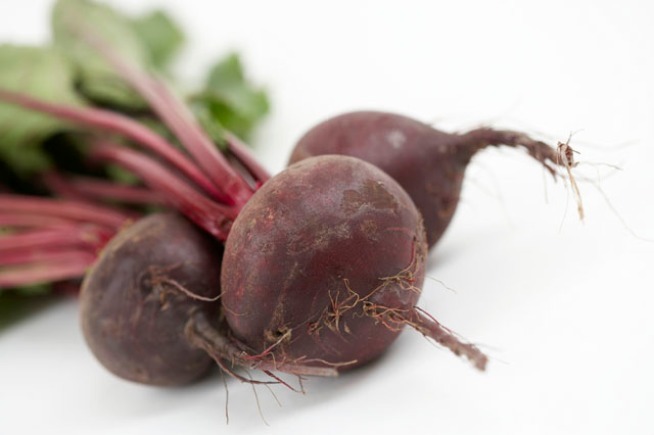 · Beet juice is added to the mix between 25 degrees and 5 degrees. · Calcium chloride added to the mix between 5 degrees and -10 degrees. *There are other alternatives to road salt as well like Calcium Magnesium Acetate (CMA) and Potassium Acetate (KA), but these are often more expensive solutions…for now. **Many entities are starting to use beet juice and other supplements to their road treatments in lieu of pure road salt. Good for them! If you’re not willing to spend that ~$500 or so to put winter tires on your Prius, maybe you’ll consider a winter-capable vehicle if you live in a region that commonly receives winter weather. Four-wheel and all-wheel drive to guarantee safety, but they sure help, especially if used appropriately in adverse conditions. A dearth of plowed roads would be less jarring for many if they had a capable vehicle in their garage I’m sure. This Prius is doing just fine on an unplowed road with its winter tires! Let me say that I’m not necessarily passionate about this argument. I’m not going to picket the Fairfax County government center or write my congressman. I do think I make some legitimate points that civilians and legislatures may have overlooked. At the very least, I’m sure there are tweaks that can be done to current snow removal policies. I admit I am completely ignorant of many complex civil and political circumstances surrounding such a wide operation portion of government budgets such as snow plowing, treatment, and removal. There are holes in my argument. But I think there’s enough reason to warrant thinking about “Snow Removal Reform”. Ok this may be a more superficial reason, but I’ve lost two awesome cars to the vehicular cancer that is rust. Sure rust is caused by general moisture as well…but road salt only expedites the oxidation and corrosion process. Obviously weather affects every individual on the planet except for the hybrid beings that live deep beneath the Earth’s crust in cavernous subterranean cities, but for some of us it’s a little more than a corollary part of our everyday existence. For some it goes a little deeper than today’s forecast as we delve into the science and subtleties of weather, its impacts on our lives, and its oft beauty, majesty, and power. Here are a few areas that resonate with me personally. I don’t really care what people say, when certain weather comes to town it just brings out a childlike sense of adventure in me. Whether it be driving through two feet of snow in a 40 year old truck, building jumps off a garage roof or snowboarding down the road in tow, ice skating on neighborhood ponds with friends, hitting an Atlantic swell to surf, or stupidly fording deluged roads, I can’t help but be persuaded by the adventurous spirit in me to engage in all sort of crazy and fun shenanigans. Yeah I understand there are real-world consequences and realities to weather like this (see “Realities” below), but when weather conditions are non-life-threatening (ones which I am referring to) there’s a lot of fun and life to be had. I personally see no mutual-exclusivity between having silly and adventurous fun in the snow and being a responsible, trustworthy adult. I think one of the unsung positive qualities of a snowstorm (especially the crippling sort) is forces us to slow the heck down. 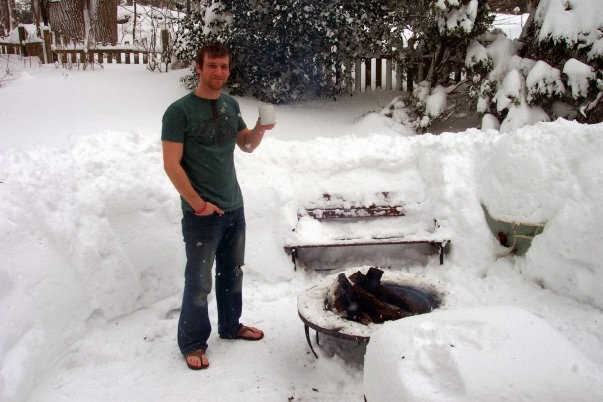 Tell me again, what’s so bad about being forced to stay home and spend time with your family and go sledding and build a snowman or two and make hot chocolate and sit by the fire – without having checked you smartphone email the whole day? Yes I know there are some negatives to snow days (i.e. kids miss school, hourly employees miss wages, etc. ), but when you were a kid what days did you remember most growing up (I rest my case) and who here would argue making money is better in the long run than spending a snow day with family? The point I’m trying to make is that we should be welcoming circumstances that force us to slow down a bit from our fast-paced lives, not expressing opposition towards them. We should be cheering the coming of crippling snowfalls (disclaimer being that you’ve prepared prudently for one), not worrying about how they’ll interrupt our schedules or hinder us getting work done. There’s not too many events that force us to spend quality friend and family time together…let’s not take those for granted. No one can deny the natural beauty that certain weather events manifest, especially fresh snowfalls. I mean is there anything more beautiful in your backyard then the newly fallen pure white coat of snow covering everything back there? Is there not an inkling of awe to be felt as that babbling brook behind your home all the sudden becomes a raging torrent? Do you not feel humbled to the bone when the thunder and lightning strike as if directed from Mount Olympus itself? 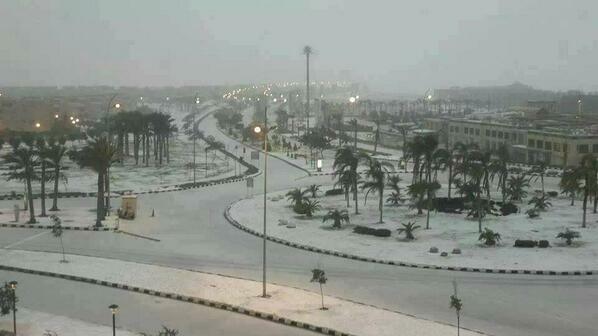 Weather can be destructive yes, but it can also be very beautiful. One man’s trash is another man’s treasure right? I know it sounds weird, but I really like shoveling snow (and chopping wood!). Perhaps it’s the engineer in me that likes to plan the optimal shoveling plan. Perhaps it’s the kid in me that likes to pile it up as much as possible in one area in hopes of building a huge sledding jump (see above) or carving out an igloo from it, or building the perfect firepit area. Up until a few years ago I wasn’t too knowledgeable of the scientific meteorological aspects of weather and specifically wintry weather. People often comment to me how I seem to know so much about weather (I'm flattered) and the such but you’d be surprised how accessible a lot of the same information the meteorologist, or “met” for short, on your local television station uses is to you freely on the Internet. Of course there are pay and other private services only for specific clientele, but weather data is more superfluous then you may think. As far as understanding science behind weather and climatology, enthusiast forums are probably the best places to gather knowledge. Below is a list of site you may find helpful if you’re intending to become an amateur meteorologist as well. …I believe it in the utmost. What a marvelous truth to behold and experience! “Can you fathom the mysteries of God? Praise the Lord! 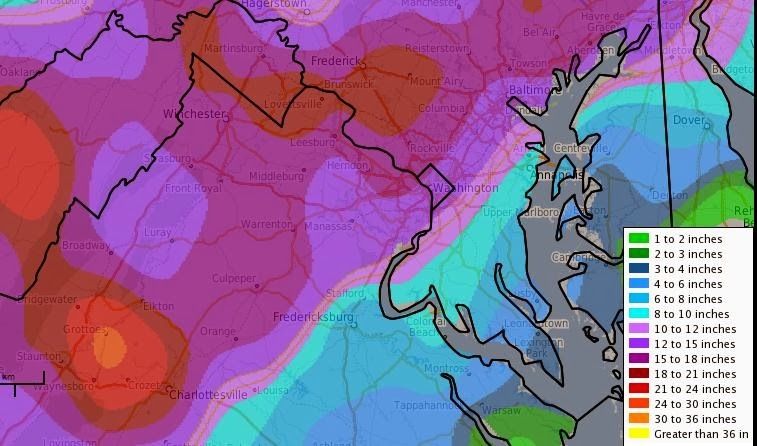 The DC Metro area is not divinely snow-cursed after all! : ) What a nice treat it was to wake up early Thursday morning and see 14 beautifully, fluffy, and wonderful inches of snow on my deck. After ~4 years of dismal, laughable, and downright pitiful “snowfalls” (if you can even call them that) – not to mention countless snow teasers that passed by nary a trace or as cold rain – the DC Metro area (Northern Virginia, western Fairfax in my personal case) finally got a legit, true-blue dump of snow Wednesday night into Thursday. And though I was getting greedy and hoping for a bit more from Thursday afternoon’s “second round”, a few inches over a foot is totally ok with me any day of the year! What you see above is the National Weather Service’s (NWS) actual snowfall totals throughout the regions. Officially Dulles Airport (IAD) received 13.3” and Regan National (DCA) came in at an even 7”. Boom on my forecast…but very close. As for my desire to see some more…well God heard my cries and blessed my home with ~14.75”. I loved the intense snowfall rates that came into our area late Wednesday evening via “deathbands” (energetic “bands” of precipitation that produce up to 1-3” or more of snow accumulation per hour!). It was beautiful and mesmerizing to watch. 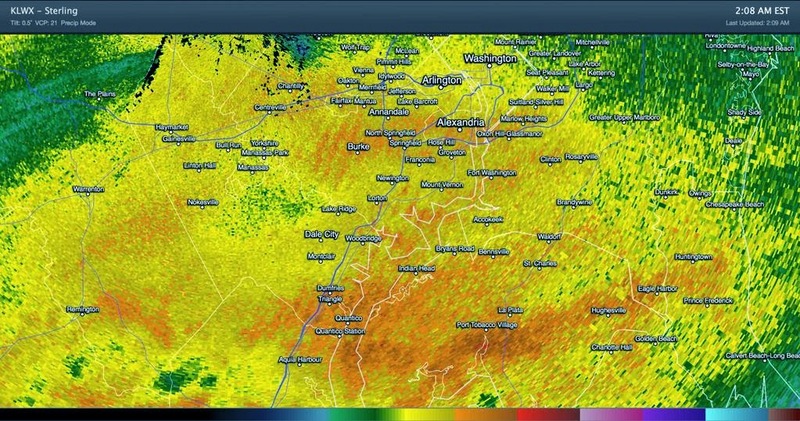 Radar showing intense bands of snowfall! I even persuaded my awesome wife to go through a drive in it at 2:30am! Early Thursday morning revealed some beautiful white, fluffy snow. This deteriorated a little as the mixed precipitation and rain, as well as rising temperatures, came through in the late morning and early afternoon, but early in the morning it was still all cold and perfect. Here’s a taste of what it looked like in the morning. I was not a fan of the change-over in precipitation in the late morning and continuing through the afternoon. Not only did it cut down on potential accumulation totals, but just made things a bit ugly and slushy – not to mention miserable for the kids to be out in. No kid, or parent for the matter, wants to be out in wet, cold snow. The sad part is that though a changeover was forecast during this time, it was forecast for mostly parts east of the city. It was never thought it’d make it as far west as Fairfax County and even Loudoun. I was also pretty disappointed in the storm’s “Round 2” which was supposed to produce a few more inches for the area in the late afternoon and evening. The pieces were in place (you can see the “second” part forming in the western Carolinas in the satellite picture above), but it never really packed the knockout punch we were all expecting. 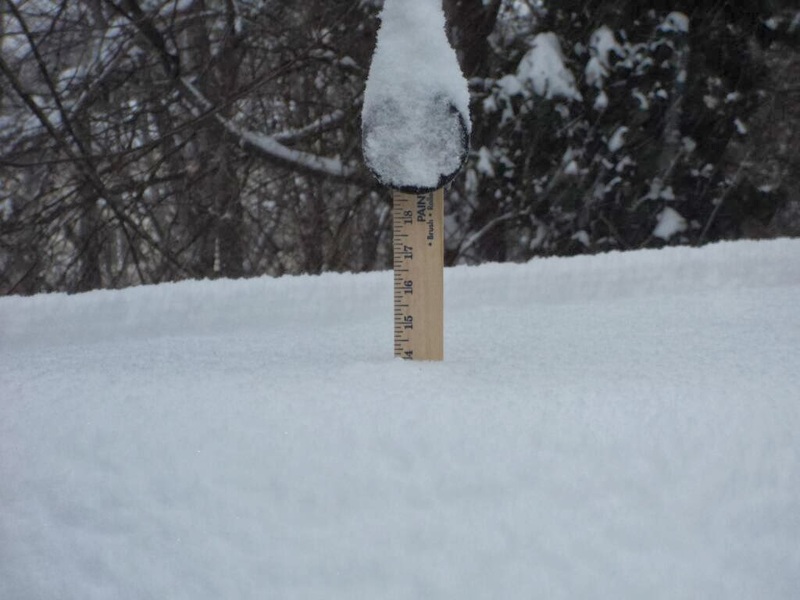 I got about 0.75” out of it…maybe an inch. Overall I had a blast with this storm…or at least until the changeover occurred. A few days leading up to it the forecast models were in disagreement and though we knew we’d get snow, there still was great uncertainty whether it’d be major, moderate, or just another garden variety like we’ve got the past few years. Thankfully factors shaped up nicely the last 36 hours and we ended getting a “boom” (low probability “upper end" forecast) scenario for the first part of the storm overnight. EbbWorld.com, All Rights Reserved © 2004, 2014. Awesome Inc. theme. Powered by Blogger.